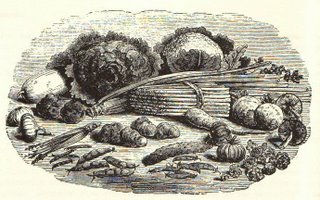 The Old Foodie: The Scarcity Root. Parson James Woodforde of Norfolk has left us with a wonderful legacy of descriptions of the food of the rural middle class in the second half of the 18th century, but on this day in 1787 he noted in his diary something of interest to himself as a farmer. "Sr Wm. Jernegan sent me by Mr. custance a Treatise on the Plant called Scarcity Root"
The good parson was very up-to-date with his agricultural reading: the treatise was undoubtedly that of the Abbe de Commerell, who wrote the first known description in 1787 of a variety of yellow beet that was proving very useful as a fodder crop in the Rhineland. The origin of the name is interesting: originally "mangold wurzel", or "root of the beet", in a Chinese whispers sort of way it underwent a transformation to "mangel wurzel", meaning "Scarcity root", which was even more appropriate as the plant was able "to constantly thrive, and to produce a very great crop, even when other kinds of roots and vegetables fail, and when there is a general scarcity of forage". cheap and wholesome", but it must also have been a culinary challenge; the leaves however were said to "exceed spinach", and the stems and stalks of the larger leaves "eat like asparagus". A vegetable in taste, very similar to very sweet, red beets; in shape, greatly resembling carrots. Wash the manglewurzel and place in a stew-pan with boiling water ad cook until tender (allow about an inch of top to remain when preparing to cook). Skin the mangelwurzel, slice and pour over the following, which has been heated i a stew-pan over the fire: One cup of vinegar and water combined, one tablespoonful of sugar, one teaspoonful of salt, a dust of pepper. Stand aside till cold then serve. Or serve hot like buttered beets. As for the alcohol, Mrs Dalgairns - who gave us a cheap treacle beer recipe in the March 30th story - also gives us a very canny Scots recipe for even cheaper mangel-wurzel beer. For a ten-gallon cask, boil in fourteen gallons of water sixty pounds of mangel-wurzel, which has been well washed and sliced across, putting some kind of weight on the roots to keep them under water; having boiled an hour and a half, they may be taken out, well broken, and all the liquor pressed from the roots; put it, and that in which they were boiled, on again to boil, with four ounces of hops; let them boil about an hour and a half, then cool the liquor, as quickly as possible, to 70° Fahrenheit; strain it through a thick cloth laid over a sieve or drainer; put it into the vat with about six ounces of good yeast, stir it well, cover it, and let it stand twenty-four hours; if the yeast has then well risen, skim it off, and barrel the beer, keeping back the thick sediment. While the fermentation goes on in the cask, it may be filled up the beer left over, or any other kind at hand; when the fermentation ceases, which may be in two or three days, the cask must be bunged up, and in a few days more, the beer may be used from the cask, or bottled. These small proportions are here given to suit the convenience of the humblest labourer; but the beer will be better made in larger quantities; and its strength may be increased by adding a greater proportion of mangel-wurzel. By this receipt, good keeping table-beer will be obtained. In wine there is wisdom, in beer there is strength, in water there is bacteria. David Auerbach. Enjoyed this post on (the ethymology of) Scarcety Root. I've taken the liberty to make a link to it on my posting on the same vegetable-with-so-many-names. See, if you wish, www.allabouteating.blogspot.com. It's a pretty beet through maturity and extremely hardy. We used to grow them for the horses. In the summer when all the grass was dry, the horses really appreciated the special green treat. Every day we'd pull one whole plant for each horse. (They weighed about two pounds.) It was like getting a giant apple with green tops. They loved them. Mangels are traditional feed for cattle and sheep. It's not appropriate feed for horses, but ONE mangel is a tasty snack for a horse when there is no green grass.